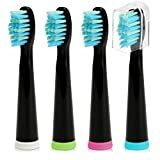 Electric Toothbrush Replacement Head x 4 solely compatible for Fairywill Pearl White / Crystal Black /Pearl Pink Electric Toothbrush. This entry was posted in Dental Shop and tagged Black, Crystal, Electric, Head, Replacement, Toothbrush by Oral Health Care. Bookmark the permalink.